In late May of 2009, I flew to Paris with my son on a mission to explore a number of pilgrimage sites I had studied in college. We visited the Tour St. Jacques which had just recently been restored. It was more a symbolic gesture than anything substantive because we were not going to walk to Santiago from there. Still, I wanted a sense of the place where pilgrims began their journey. This was a more complex trip than I had attempted in the past. Typically, I’d go to Paris and come home, but this time, we spent a few days in Paris, flew to Toulouse where we took day trips to Moissac and Conques – both important medieval pilgrimage sites in southwestern France. 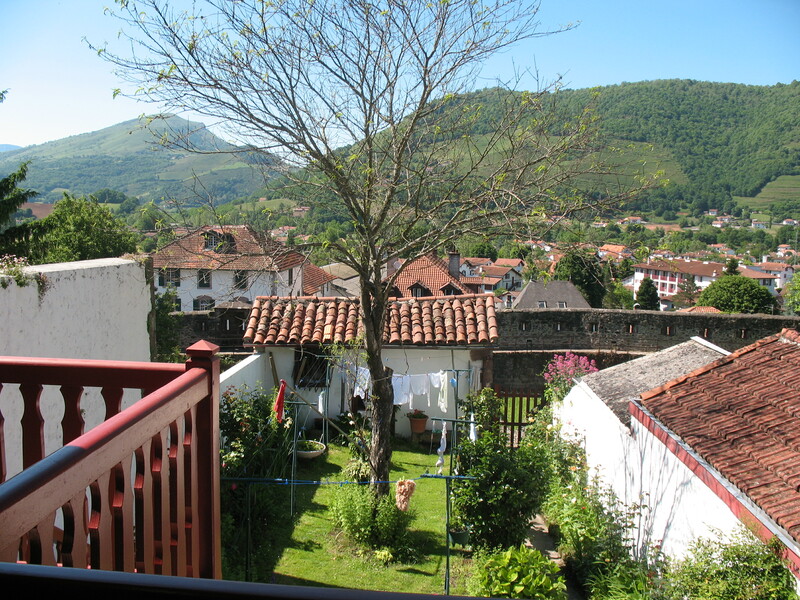 From Toulouse, we took a train to Bayonne and then on to St. Jean Pied de Port, the traditional starting place for the Camino Frances in the French Pyrenees. After that, we went on to Pamplona, Madrid, and then back to Paris with my daughter. We planned to walk to Pamplona – just three days on the Camino – but we were not adequately prepared, we were carrying the wrong gear, had the wrong boots, had not done sufficient research, and when it came time to decide, do we go on walking or do we bail and take a cab to Pamplona, we hailed the cab. But I learned quite a bit that made later walks much more successful. This is a bit of my learning experience. 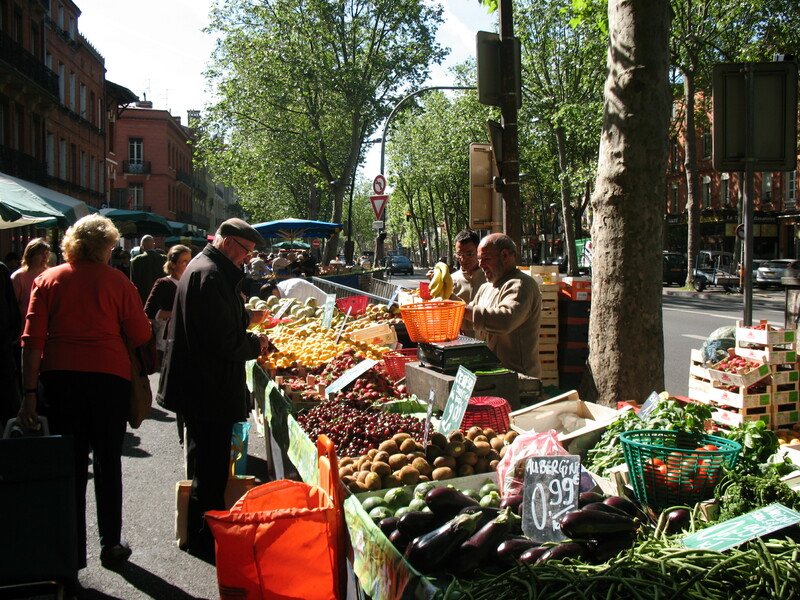 1) Rather than starting in Paris, unless you aspire to walk the Camino starting in Paris, I recommend Toulouse. This is a wonderful town with fabulous food, beautiful churches, and great day trips to other wonderful towns. We based our operation at an inexpensive, centrally located Ibis hotel and took the train one day to Moissac, to Conques the next. It was easy taking the train from Toulouse to St. Jean, changing trains in Bayonne. 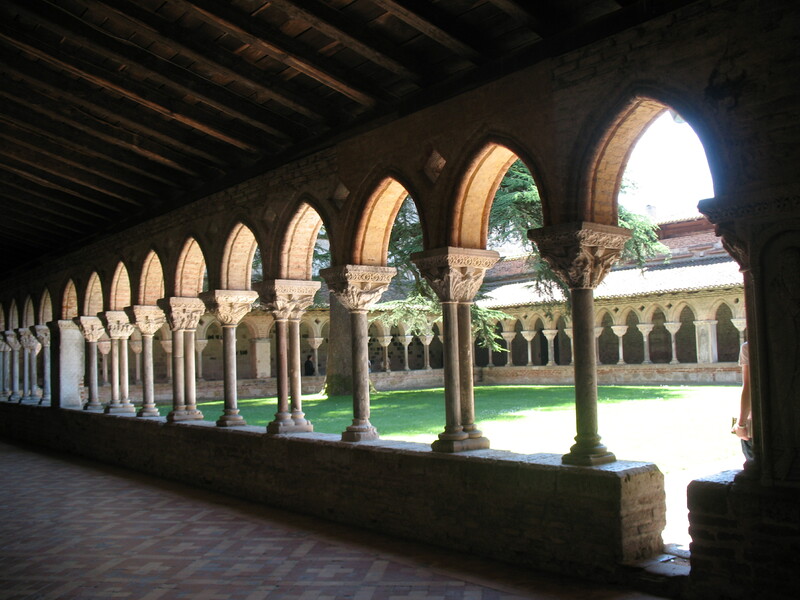 2) The highlight in Moissac is the serene cloister of the St. Pierre Abbey. It was nearly demolished when the train line was put in and now, it’s the scene of many local weddings and events. You can get a sense of the divine isolation that its residents must have felt when you view the columns and capitals of the cloister walkway. There’s a sense that viewing these images would both challenge you and bring you some comfort as you kept to your prayers, walking the length of the square space. 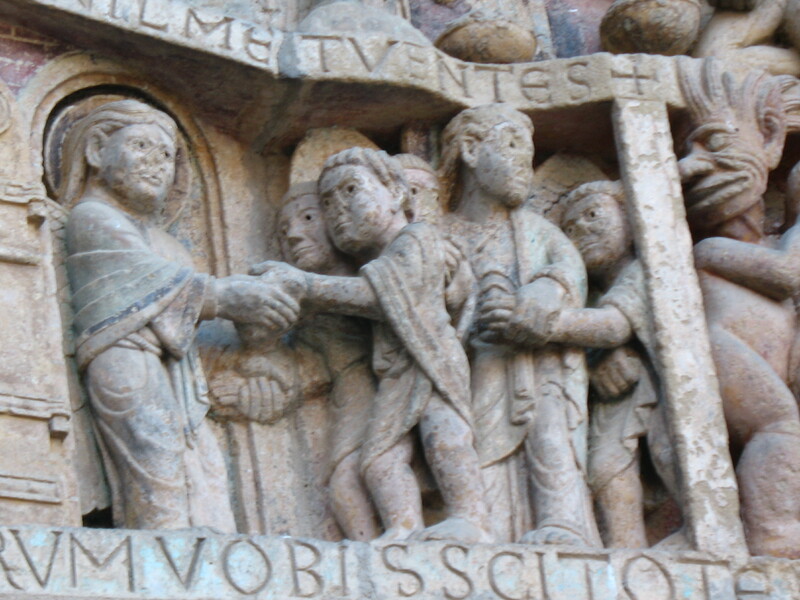 3) I was introduced to the village of Conques when I studied the sculptural program at the Abbey church of Ste. Foy. I found the the story of Ste. Foy to be charming and the photos of the small town and the church were something I could not forget, swearing early on that this was the first place on my life’s bucket list. To be fair, we didn’t call it a bucket list in the mid 1970s – it was just an object of desire. 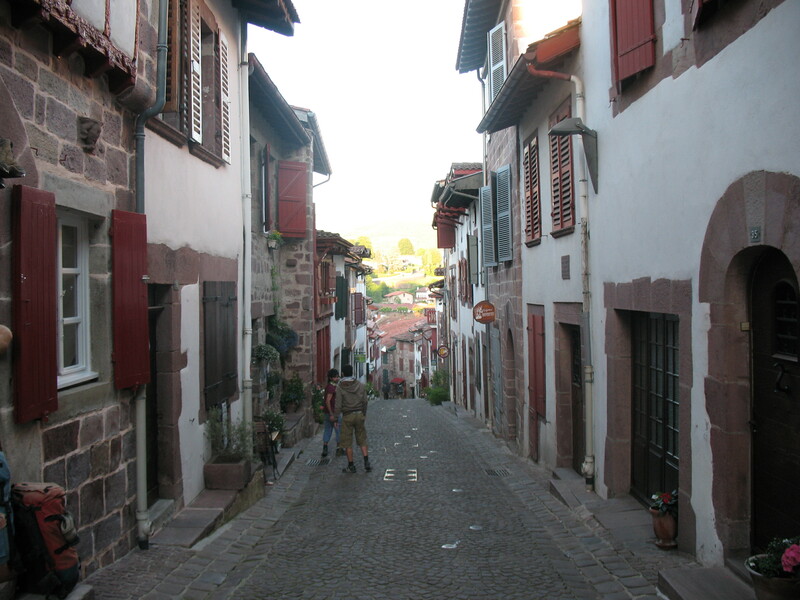 We had no trouble getting to Conques but we nearly had to spend the night there – not our plan – when we could not find a car to take us back to the train station for our return to Toulouse. What was the issue? Typically, there was a bus that arrived in the early evening, you would spend the night and then return in the morning. We wanted lunch so we pieced together a train plus cab that took us right into Conques. When we wanted to leave in time to catch a late afternoon return train. there was not a single taxi. I even asked a young man if he had friends who might want to make a few Euro taking us back to our train, but he told me all his friends were walking the Camino. We ended up walking back into town and asking a woman at the post office to call us a cab. We made our train with about 8 minutes to spare. 4) Toulouse to St. Jean Pied de Port – another easy train trip. We stopped in St. Sernin in Toulouse to stamp our pilgrim’s passports, took the train to Bayonne, spent about an hour, hour and a half in Bayonne, then changed trains to St. Jean Pied de Port. The trip passed through the town of Lourdes: another pilgrimage for another time. 5) St. Jean Pied de Port. Arriving here, we walked first to the Pilgrim Office where we checked in, got stamps for our pilgrim’s passports, and bought a shell for my son. We only walked about two doors down the street before I realized I needed one as well and we returned, paid something like one Euro, and I collected my shell. Pilgrims are traditionally identified by their large scallop shells. In the past, carrying a shell was a way to prove that you had completed the pilgrimage because you would have been to the Atlantic coast of Spain. Finding a place to stay was as simple as asking the woman who sold me the shell for a recommendation. She referred us to a friend of hers who gave us a room with two beds and a view of the hills beyond the terrace out back. We had dinner in a lovely place on the river where we watched a young man jump into the water and play like an 8-year-old boy. We visited the church and explored the town after dinner. In the morning, we had a few pieces of toast with cafe au lait. The running joke among the locals is the standard French phrase, “a demain!” Why joke? Because everyone leaves for the pilgrimage routes right away. I doubt there are more than a handful of tourists who would spend more than one night in this lovely town. So, “See you tomorrow” is funny. In St. Jean, the pilgrim’s office is the most helpful place. They will give you maps – which I managed to lose – and lots of helpful advice. Posted in Camino Frances. Tagged France, hiking, Spain, walking.